Lily falls in the group of bulbous plant belonging to genus Lilium. Lilies are commonly named as lily, Asiatic lily and oriental lily. They are perennial plant up to 2 to 6 ft height. It gives rise to beautiful, prominent flowers. They are mostly known by their large, showy and fragrant producing flower.They rank fourth in terms of plant popularity. They come in different size, shape and colors. Lilies are native to temperate northern hemisphere but there are some species growing even in the northern subtropics. Most of the lilies grow in the cool temperate climate and they fall in the category of deciduous plants. They remain dormant in winter. The term ‘lily or Lilium’ was derived from the Latin word. It is a Linnaean name. The term lily was applied to other flowering plants. They partially resemble to true lily. Some of them are water lily, lily of the valley, daylily, calla lily, cobra lily, leek lily, ginger lily, fire lily etc. From long time white lily has been regarded as the symbol to modesty and virginity, orange lily as passion, Easter lily as Virgin Mary, yellow lily as gaiety and lily of the valley as sweetness and inner purity. · The botanical name of lily is Lilium. · It falls in the type of flower. · It require full to partial exposure to sunlight. · It comes in pink, white, yellow and orange. · It blooms in spring, summer and fall. · This flower has the power to attract butterflies, bees and other insects that help carry out pollination. Lilies give rise to a trumpet shape blossom of about 6 inches diameter. The stem of lily grows up to three feet height and supports up to eight blossoms. The leaves are dark green in color. Lilies grow from the bulb. Thus they fall in the category of bulbous flowers. Some bulbs grow deep under the ground and there still are some bulbs that grow near the surface of the plant. Some bases of the bulbs develop into rhizomes with numerous bulbs around it. Lilies give rise to 6 trumpet shaped petals with colors depending upon its specie. Lilies produce large flowers. They are wonderfully attractive and come in varied colors such as white, orange, yellow, purple and red. They usually come to full bloom during the late spring and summer. The bloom lives up to one to two weeks. The fragrant of lily is breathtaking. It can be kept in your room as a source of perfume. After the bloom is over, seeds get ripened in the late summer. Lilies are mostly found around the world. They are most commonly found in different parts of Europe, Asia, Japan, India, Indonesia, Canada, America etc. They grow actively in grasslands, woodlands and also in marshlands. They grow better in case of good provision of acidic or lime-free soil. 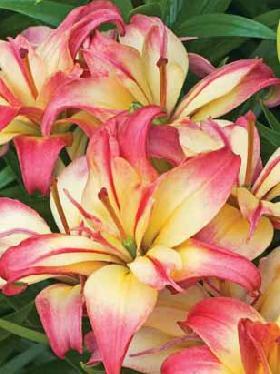 It is not a difficult task to take care of lily as long as you provide good soil to it and plant in the right season. Thus, the best time to plant lily bulbs is in the autumn.We can cultivate lily in different places such as in a pot, garden soil or in the nursery provided that the plant is exposed to full to partial sunlight. Dig the soil up to 12 to 15 inches deep.It grows favorably well in the temperate and sub-tropical regions. Lilies are planted in loamy, porous soil and well drained soil. The outcome is super good when the plant is planted in an organic rich soil. Proving water to the plant in the morning and evening during its active growing stage is very essential. Lilies grow not just from the bulbs, it is possible to plant lilies even from seeds, scales, bulbils and bulblets too. However, growing lily from the bulb is best suggested as the plant take much longer time to bloom from other possible methods. Lily is not a fussy plant to take care of. It need not be watered daily but when you provide water to this plant, make sure that you water the plant deeply. It is also suggested to feed the plant with a good amount of high-potassium liquid fertilizer during the growing season and make sure you avoid high-nitrogen fertilizers. And once the blooming is over, remove all the dry leaves and flowers. Some virus spread by aphids can turn out to be troublesome at times. The red lily is often attacked by beetles, slugs and snails. The plant if not protected gets attacked by deer, rabbits, groundhogs and voles. Thus, it is wisely suggested to protect this plant from such harms. · They serve as beds and borders plant. · Lilium auratum is a Japanese lily, white in color. It has good fragrant and is used as a cut flower. · The bulbs of Lilium bulbiferum (commonly known as orange lily) are edible. It tastes sweet and can serve as a good substitute to potato. · Lilium canadense also commonly known as Canada lily is used in making scent or even kept in the room to add scent to the room. · Lilium candidum or Madonna lily, the bulb of this plant is used in making medicine for it has high demulcent and astringent purpose. · Lilium henryi or henry’s lily helps relieve congestion, nosea and vomiting during pregnancy. · Lilium japonnicum or Krameri, this lily has nourishing power and is useful in removing diseases relating to chest pain. · The bulbs of Lilium lancifolium or tiger lily is edible. · Lilium langiflorum or Easter lily is used in flower beds. · Lilium martagon or Turkscap lily is used in relieving heart diseases, cardiac pain and also in the treatment of angina pectoris. · The bulbs of Lilium pardalinum or Panther lily is also edible. · The flower of Lilium speciosum or Japanese lily difuses sweet and honey smell perfume. · The oil extracted from lily has great healing power to heal skin damages. · The oil from lily can be used for massage, as a moisturizer for facial, dry cuticles, elbows, under eye oil and also as an after bath oil.